"The maker movement is huge right now, as evidenced by renegade craft fairs and pop-up shops opening everywhere. And these sellers don't carry the typical knitted doilies and homemade kaleidoscopes. This new generation of retail is selling things like sustainably harvested green tea, laser-engraved wine decanters and handmade bamboo iPod covers. You know, stuff that hipsters want. Among the many factors affecting the explosion of small business, the most compelling is the number of new technologies springing up to support the small-scale retailer. Companies such as Square and now Amazon have released devices that allow businesses to collect payments quickly and easily, without the typical expense of an old-fashioned cash register and credit card reader. This process, dubbed point-of-sale, allows retailers to run credit card payments through virtually any tablet device-including smartphones. 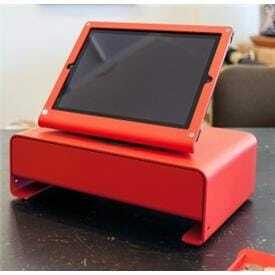 These new point-of-sale registers often need protection. Enter Heckler Design-a Valley business that makes tablet holders, stands and furniture. With the explosion of small business start-ups, Heckler has seen a huge upswing in sales. Business is booming-so much so that the small company (about to take on only its ninth employee) will have to move its warehouse to a new, even bigger location. They only recently relocated into their current 6,000-square foot space. "I thought we'd be in this space for at least two years," says founder, designer and president Dean Heckler, shaking his head.